Why is the government planning to force through devastating cuts which are hitting the poorest the hardest, destroying the welfare state and worsening the economic crises when it could save us over £100 billion by scrapping Trident? The money could be better spent on housing, jobs, pensions, education and health. For the month of April, Bruce, now in his 80’s, is hitting the road on behalf of CND, spreading the Scrap Trident message across England. He is working with a range of different organizations, including the Green Party, to highlight the wasteful spending on Trident when so much investment is needed to eradicate poverty, boost people-friendly development and make our world a safer and more peaceful place to live. 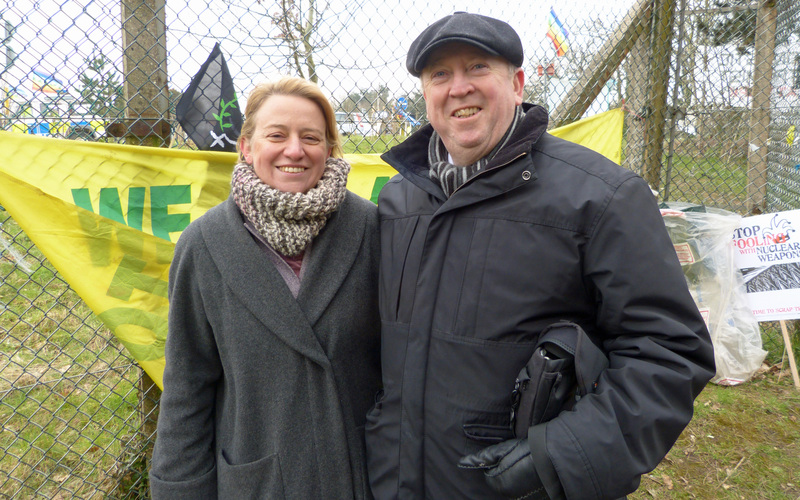 The Green Party Leader, Natalie Bennett and Green MEP, Keith Taylor joined together in a round of speaking at the annual CND Easter protest at Aldermaston on 1st April. The Scrap Trident campaign is trying to put across the connection between the £100 billion to be spent on Trident and the savage cuts that people are being exposed to. It is important to campaign now to stop plans for the replacement of Trident being progressed. It will be too late to wait for the next General Election as whoever is in government will be under pressure not to back out for economic reasons. If we go ahead and replace Trident it will mean Britain possessing nuclear weapons until nearly 2060 – 90 years after we agreed to disarm. If you are one of the people who think we need nuclear weapons as an insurance policy consider how non-nuclear countries view this. If Britain shows the world that we think our security depends on us having nuclear weapons far into the future, then other countries without them, such as North Korea, will want them too. So the dangers of accidents or crises increase. It’s a deep hypocrisy to say “we can have them but you can’t”… I quote from Bruce’s website: “Our obligation, as a country is to negotiate the elimination of all nuclear weapons. If we replace Trident, in any shape or form, other countries will take the message from us that we think nuclear weapons improve our security. It’s an open invitation to get their own. It’s hypocrisy to say we can have them but they can’t”. This entry was posted in Derbyshire County, East Midlands, Elections, Environment, International, National, Peace & Human Rights and tagged Derbyshire County, Elections, Environment, Green Party, nuclear weapons, Trident. Bookmark the permalink.